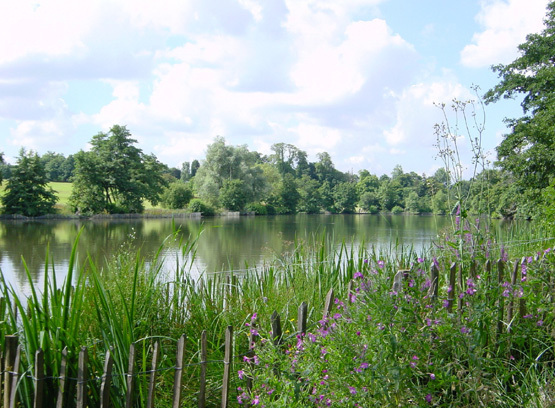 A lake in the weald, U. K.
What is in a lake? 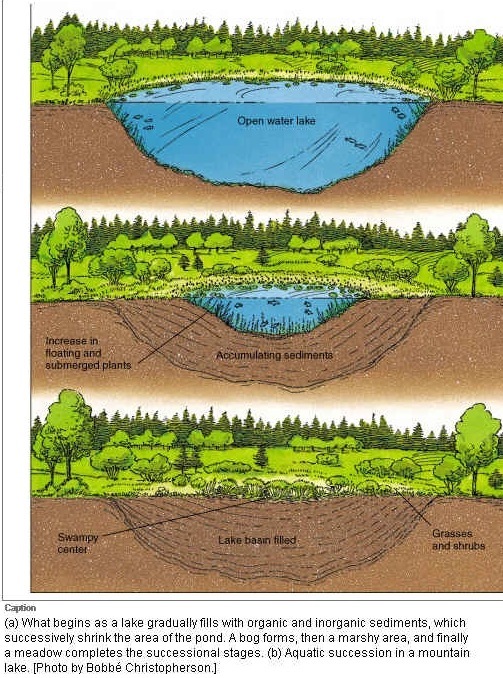 Rivers drain an area called a watershed that delivers nutrients like nitrogen in the form of solvents derived from runoff of water on the surface of the land to intervening water bodies called lakes. The Lake District in Cumberland, U. K.
Any lake is a basin filled with a variable mass of water and very different kinds of living communities, called ecosystems. Depending on the amount of nutrients some aggregations of plants and animals are more productive than other ecosystems in terms of building functional support networks for many living things. “The first indispensable requisite is a thorough knowledge of the natural order—an intelligently conducted natural history survey." Stephen Forbes, 1880, author of "The Lake as Microcosm." "Nowhere can one see more clearly illustrated what may be called the sensibility of such an organic complex,--expressed by the fact that whatever affects any species belonging to it, must speedily have its influence of some sort upon the whole assemblage. He will thus be made to see the impossibility of studying any form completely, out of relation to the other forms,--the necessity for taking a comprehensive survey of the whole as a condition to a satisfactory understanding of any part. If one wishes to become acquainted with the black bass, for example, he will learn but little if he limits himself to that species. He must evidently study also the species upon which it depends for its existence, and the various conditions upon which these depend. He must likewise study the species with which it comes in competition, and the entire system of conditions affecting their prosperity, and by the time he has studied all these sufficiently he will find that he has run through the whole complicated mechanism of the aquatic life of the locality, both animal and vegetable, of which his species forms but a single element." "These fluviatile lakes are most important breeding grounds and reservoirs of life,--especially as they are protected from the filth and poison of towns and manufactories by which the running waters of the state are yearly more deeply defiled." 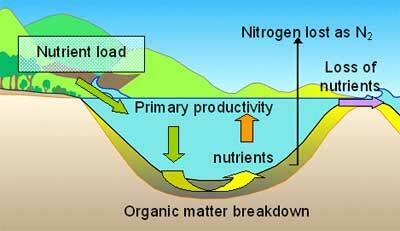 "The amount and variety of animal life contained in them as well as in the streams related to them, is extremely variable, depending chiefly on the frequency, extent, and duration of the overflows. This is, in fact, the characteristic and peculiar feature of life in these waters. There is perhaps no better illustration of the methods by which the flexible system of organic life adapts itself, without injury, to widely and rapidly fluctuating conditions. Whenever the waters of the river remain for a long time far beyond their banks, the breeding grounds of fishes and other animals are immensely extended, and their food supplies increased to a corresponding degree." Stephen Forbes, "The Lake as Microcosm," Bulletin of the Scientific Association (Peoria, IL), 1887: pp. 77-87. Raymond Lindeman measured the functional component parts of a cedar bog lake in Minnesota based on what sorts of creatures ate other plants and animals. He made a startling discovery. He and later other recognized that "Detritus is central to food webs," because of what he called trophic dynamics, or how food, in the form of carbohydrates, proteins, and energy fuel a living system as the conditions change throughout the year. One cause of the seasonal shifts is the amount of radiant energy available from the sun as the earth tilted on its axis of rotation moves annually around the sun. Energy pyramids, however, will always have an upright pyramid shape if all sources of food energy are included and this is dictated by the second law of thermodynamics. See: Lindeman Raymond L., "The Trophic-Dynamic Aspect of Ecology," Ecology 23:4, 399-417, October 1942. Located in Wyoming and a small part of both Montana and Idaho, Yellowstone National Park is a 2.2 million acre ecosystem that is a part of the more expansive Greater Yellowstone Ecosystem Area. The latter is over 20 million acres. In Yellowstone National Park, Yellowstone Lake is a natural lake and is the largest high altitude mountain lake in the United States at 7,733 feet above sea level. The lake harbors six fish species: cutthroat trout, longnose dace, redside shiners, lake chub, long nose suckers, and lake trout. The former two are native; the latter four were introduced in the mid-1900s. The original lake was 200 feet higher than the present-day lake, extending northward across Hayden Valley to the base of Mount Washburn. It is thought that Yellowstone Lake originally drained south into the Pacific Ocean via the Snake River. The lake currently drains north from its only outlet, the Yellowstone River, at Fishing Bridge. The elevation of the lake's north end does not drop substantially until LeHardy Rapids. Therefore, this spot is considered the actual northern boundary of Yellowstone Lake. Once prevalent throughout the Park, the gray wolf, Canis lupus was eventually exterminated in the early 1900s. A brief summary of the reintroduction of this species in the mid 1990s is provided along with a description of some of the ecological consequences of this action. Another example of how the presence of wolves may be affecting the distribution and abundance of species is the regrowth of certain tree species in Yellowstone. When wolves were absent from Yellowstone National Park, the other predators that killed elk (shown on the previous page) were not able to control the population growth of elk. As a result, willow, cottonwood and aspen stands were heavily browsed by the elk. When wolves arrived, increased predatory pressure on the elk occurred. Some scientists believe that this forced elk to leave woodland areas and move into open habitat in order to be able to better see predatory wolf packs. This anti-predatory behavior by elk reduced browsing pressure on the trees, thereby enhancing the ability of these trees to produce new trees. However, recent research indicates that while wolves have increased predation on elk, other factors helped to promote the growth of these trees. This type of impact on a trophic level, lower on the food chain, that was created by the introduction of wolves is called a trophic cascade. While the exact causative agent(s) responsible for the regrowth of aspen in Yellowstone is still being studied, another ecological benefit from this plant regrowth is the resources it provides to other species. 1. Beaver have returned to Yellowstone National Park since the abundance of aspens has provided beaver with food, as well as a wood for their dams and lodges. 2. Beaver ponds have created habitat for aquatic and semiaquatic life (e.g., mink, muskrats, ducks, geese, etc.). 3. The shade conditions on nearby streams has helped to cool water so that it will be more conducive to trout. 4. Soil stabilization by aspen trees has reduced erosion and enhanced water quality. Elk foraged on certain species of trees such as aspen (depicted in the photograph). This reduced the ability of the trees to survive and repopulate the forest. Erosion along streams reduced water quality. When wolves hunted in these forests, elk were vulnerable to capture. Therefore, they moved to open fields where their ability to see approaching wolves improved. 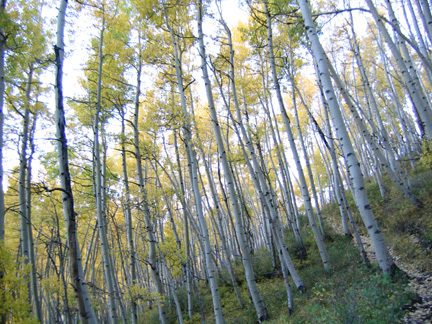 Aspens were able to survive and regenerate, thereby encouraging the population growth of these trees. Another example of how the presence of wolves may be affecting the distribution and abundance of species is the regrowth of certain tree species in Yellowstone. When wolves were absent from Yellowstone National Park, the other predators that killed elk were not able to control the population growth of elk. As a result, willow, cottonwood and aspen stands were heavily browsed by the elk. When wolves arrived, increased predatory pressure on the elk occurred. Some scientists believe that this forced elk to leave woodland areas and move into open habitat in order to be able to better see predatory wolf packs. This antipredatory behavior by elk reduced browsing pressure on the trees, thereby enhancing the ability of these trees to produce new trees. However, recent research indicates that while wolves have increased predation on elk, other factors helped to promote the growth of these trees. Scientists eye unusual swarm of Yellowstone quakes, 2010. Trophic dynamics --literally: shifting nourishment; meaning feeding habits or patterns that are altered from place to place and season to season. How an organism or species is nourished. Trophic cascades --literally consequences in the community when feeding behavior shifts. When the diet of most of the grazers changes for reasons of scarcity, predation, fire or succession a trophic cascade or consequential change in another part of the ecosystem is evident. The consequential and subsequent effects on the patterns of vegetation and habits other herbivores when feeding behavior of a dominant or widespread group changes.